Weekly Fishing Tip: Why is fall fishing so great? Many anglers will tell you that as fall rolls in the fishing gets better and better. But why is this? There isn’t much formal research to answer that question, but several factors could be contributing to this influx of angling opportunities: forage availability, dropping water temperatures, fish movement, or oxygen availability. Some say it could just be related to less fishing pressure and/or better angling techniques. The bottom line is, if you don’t consider fall to be an ideal time to go fishing you may want to rethink that sentiment. Some of the biggest crappie, muskellunge, walleye and smallmouth bass can be found in the fall – don’t you want to experience that? This tip adapted from Michigan Outdoor News. The October 2013 edition of “Reel in Michigan’s Fisheries” can now be found on our web site. This new online publication highlights work that the Fisheries Division is doing on the inland lakes and streams. To view this publication click here: October 2013 edition. Lake Erie: Boat anglers are trolling husky jerks for walleye off the River Raisin Channel in 12 to 16 feet. Perch anglers were just south of the launch at Bolles Harbor and off Stony Point. Rumor has it a couple walleye were caught by shore anglers off Luna Pier and Sterling State Park. Huron River: Is starting to produce some steelhead. Most of the fish were caught in the deeper holes. Try a jig and wax worm, Hot-n-Tots or spinners. Detroit River: Had good walleye action in the lower Trenton Channel and near Sugar Island. Anglers are jigging or hand-lining with bigger rapalas. Mid-day was best. Yellow perch fishing was on and off in the canals near Gibraltar. Lake St. Clair: Is once again producing smallmouth bass. St. Clair River: Is still producing some walleye up near Port Huron. Salmon have been caught in Mill Creek which flows into the Black River. Lexington: Had no boats however a couple pier anglers caught the occasional chinook or brown trout. Those tight lining in the middle of night caught chinook but the fish are really dark. Port Sanilac: Pier anglers caught the odd salmon and a few brown trout. Steelhead are starting to show up as the fish planted usually come back in November and December. Fishing inside the harbors should be good until freeze-up. Harbor Beach: No boats were out, just shore and pier anglers. Those fishing all day did manage to catch a couple brown trout in the Edison Channel. Saginaw Bay: Perch fishing was slow however a few walleye were caught by those wading in the Hot Ponds and casting jigs. A couple boats trolling for walleye in 18 feet of water off Linwood caught some nice fish on rapalas. The occasional limit catch was reported but most boats came back with five or six fish. Crappie were caught in the marina at Sebewaing. Dredging continues at Caseville. St. Joseph: Pier anglers fishing spawn on the bottom caught steelhead. A few whitefish are now being caught. St. Joseph River: Steelhead fishing is slow at the Berrien Springs Dam as very few fish are in the ladder. Water temperatures are in the correct range however flows were below normal. Rain is needed to get more fish up into the river. South Haven: Pier anglers caught a couple steelhead with spawn on the bottom. Black River: Had low angler pressure even though some have caught steelhead. Kalamazoo River: Is producing steelhead, walleye and catfish below the Allegan Dam. The occasional brown trout has also been caught. Holland: A few boats were still heading out for steelhead. Pier anglers have caught a few whitefish and steelhead. Grand Haven: Pier anglers have caught the occasional steelhead and whitefish on spawn. The water is not quite cold enough yet. Grand River at Lansing: Salmon were caught but most of the fish are gone except for a few still hanging around in isolated spots. Muskegon River: Pike fishing has picked up with some nice fish caught in Hardy Pond. Steelhead are in the river. Try fresh spawn or a jig and wax worm. Whitehall: Pier anglers are catching steelhead when floating spawn. Rogers City: Boat fishing is pretty much done. The marinas, restrooms and the fish cleaning stations are closed for the season. The docks at the launch ramps are still in and should be for another week or two. Those pier fishing had little to no success. Brown trout were reported in the marina however they would not bite. Thunder Bay River: Most of the salmon have spawned and are now in the final stages of life. Steelhead fishing is still slow. Anglers are starting to catch a few perch but many are small. Harrisville: Angler pressure has dropped off which means fewer fish are being caught. Watch for the fall steelhead to start showing up and walleye should start moving in closer to shore. Oscoda: Pier anglers are picking up a few walleye late at night and just before sunrise. Small spoons and body baits seem to be work best. Au Sable River: Salmon are still trickling into the river but the numbers are small and the fish are not in very good shape. Steelhead are moving in slowly. Fish were caught on spawn or flies. Tawas: Fishing was slow because of the weather and the large number of minnows inside the harbor. Au Gres: A few anglers ventured out for perch but catch rates were generally poor. The water was quite dirty from all the wind and wave action. Au Gres River: Fishing pressure was very light at the Singing Bridge. Harbor Springs: The dock at the boat launch has been pulled. Petoskey: Pier anglers are catching steelhead with spawn bags off the Clock Dock, the D Pier and the Bay View breakwall. Most are fishing in the early morning with spawn, spinners or small spoons. Bear River: Only had a handful of people at the dam trying for the last salmon or one of the steelhead coming in. Those fishing down near the mouth caught steelhead on spawn bags. Water levels were high and fast. Charlevoix: Windy conditions kept smallmouth anglers in the channel. A couple anglers fishing the slip near Medusa were targeting steelhead and round whitefish. Try a single egg just off the bottom. Traverse City: Few boats have been out in either bay because of the weather. Those that were able to get out did manage to catch a few smallmouth bass. Elk River: Fishing has been good for lake trout, steelhead, and the occasional salmon. Try drifting orange or pink spawn bags below the power dam. Boardman River: Lake trout and steelhead fishing was fair. The majority of fish were caught on spawn bags however wet flies were also productive. Glen Lake: Was producing some nice yellow perch. Frankfort: Pier fishing here and Elberta has been very good for steelhead and the occasional coho. Spawn worked best. Some of the steelhead were more than 10 pounds. Those surfcasting caught steelhead. Manistee: Pier anglers and those surfcasting have done well some days but not so good on other days. Manistee River: Has fair steelhead fishing. The river is low and clear right now so light line and small presentations are a must. Ludington: Pier anglers and those surfcasting are taking some steelhead in the early morning. 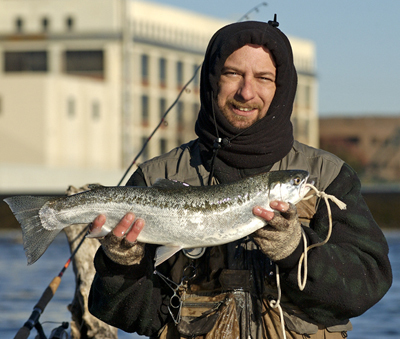 Pere Marquette River: Catch rates are fair for steelhead. Water levels were low and clear which makes trout fishing a bit more difficult. Pentwater: Pier and channel anglers were unable to fish for several days because of a large mass of weeds. Pentwater Lake: Boat anglers reported decent steelhead action when trolling flatfish. The best speed was between 1.3 and 1.5 mph otherwise the lines will tangle. Marquette: Lake trout fishing was fair as the fish move in closer to shore. Most are fishing off the Lower Harbor Breakwall. Some have caught a couple lake whitefish or menominee off the black rocks in the Upper Harbor. Coho and steelhead were also taken. Surface water temperatures have dropped to the upper 40’s. Carp River: Anglers are still catching a few coho near the mouth. Try spinners or spawn bags. No steelhead to report. Chocolay River: Boat and shore anglers are catching a few coho. Most of the fish are dark males but some have caught the occasional silver fish. They are using stick baits, small spoons, spinners and spawn bags. Some caught steelhead or brown. Menominee: A few walleye were caught at night in 15 to 25 feet of water when trolling north and south of the river. Smallmouth bass were also caught. Cedar River: Shore anglers were casting spoons or drifting spawn. Salmon were seen but no fish were caught. Boat anglers caught smallmouth bass near the boat launch and under the interstate bridge. Menominee River: Catch rates were fair to good for perch. Anglers are drifting crawlers or minnows between the mouth and Stephenson Island. Lake trout and salmon anglers wading near the Hattie Street Dam reported slow catch rates when drifting spawn. Some were starting to target walleye off the Cat Walk but none were caught. A recent survey did show steelhead and brown trout moving up into the river. Little Bay De Noc: Those able to get out were mainly perch fishing. Most were targeting waters eight and 23 feet deep around Butler Island, Brach’s Cabins or the flats. Minnows and crawlers worked best. Northern pike are still being caught. Big Bay De Noc: Had no walleye reports however smallmouth bass anglers were active in Garden Bay. Fish were caught in 15 to 38 feet off the Bluff. Minnows worked best. Only a few perch were caught. Munising: Look for late arriving coho in front of the Anna River. Catch rates for pier anglers were very slow for coho, splake and steelhead. Coho were hitting on spawn bags and splake were hitting on a single egg. Salmon were smaller this year and most of the coho were females. Anna River: Those fishing upstream reported good catch rates for coho and splake. Grand Marais: Fishing was generally slow for those trolling near the mouth of the Sucker River, pier anglers and shore anglers. A couple steelhead were taken by those drifting spawn or casting. Big Manistique Lake: Had good walleye and perch fishing. Two Hearted River: Was still producing the occasional coho. Tahquamenon River: Had good walleye and musky fishing. St. Mary’s River: Walleye are still good at the Dumping Grounds just south of Kemps Point, and Moon Island. Catches were made by those trolling rattle traps and reef runner crank baits in eight to 12 feet. Smallmouth bass have been caught by those trolling or jigging tube jigs just off the rock ledges at Birch Point and just north of the Gogomain River in six to eight feet. Drummond Island: A few perch were caught by those drifting minnows between the south end of James Island and the Drummond Island Sportsmen Club in Maxton Bay. Cedarville and Hessel: Had good perch fishing in Musky Bay. Carp River: Is producing coho and pink salmon. Those targeting steelhead were having a good time. One lucky angler harvested one weighing 10 pounds. St. Ignace: Salmon were hanging out near the city launch but the fish are deteriorating quickly. 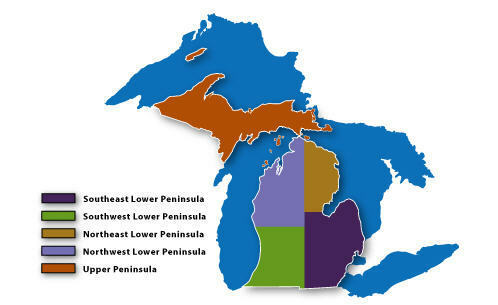 Tip of the week: hunting digests are always available at www.michigan.gov/dnrdigests.